Manju Kapur is a professor of English Literature at Miranda House, DU. Her first novel, Difficult Daughters, received the Commonwealth Award for the Eurasian region. In the past decade she has contributed to the literary world immensely by books such as Home, A Married woman and most recently the critically acclaimed novel, The Immigrant. 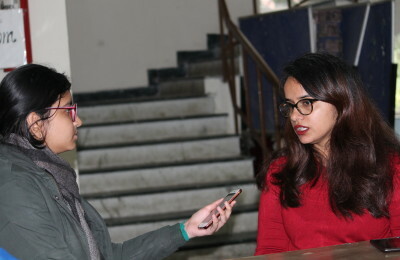 A few days before The International Women’s Day are correspondent Hunar Katoch, gets the opportunity to talk to the woman behind these books of absorbing intelligence. DUB: As a professor of literature in Miranda House, when you write a book do you keep in mind the amount of critical analysis a book can be subjected to? MKD: Yeah well, that’s an interesting question, one I haven’t been often asked. No you don’t, as a writer your approach to a text is completely different. Before I started writing I actually thought that perhaps teaching or critiquing the novel may give useful inputs at the time of writing one, but when you read, criticize or teach it, you look at it from a completely different perspective. Often teachers dig out things in a novel that the writer isn’t fully conscious of when he/she writes the book. If I had to write a book the way I teach it, I doubt I’d be able to write a single word. At the time of analysis one deconstructs the characters and the theme so much but when you write the book its much simpler, so the writing process it’s very different. from the teaching process. DUB: Are you currently involved in writing any other books? DUB: Have your years as a teacher of literature influenced your writing technique? MKD: Not my technique, but definitely the way I look at a character: always placing them in a context. That is exactly what I do while writing a book. If I would have done that otherwise also, I can’t tell since my writing is inextricably linked to the study of literature that I’ve done for so many years. DUB: Most writers are prone to writers block? How do you overcome it? MKD: See first of all I personally am not prone to writers block. Even though we hear a lot about it, I think it’s a myth. Whenever I’m stuck at a particular section I move on to something else come back to it later to prevent sitting in front of the computer without knowing what to write. Ensuring no compromise in the quality of the content requires many rewritings .I would say that writers block is not something I identify with rather its the repeated rewriting process until you are able to say exactly what you mean to say. DUB: Your books, be it home or difficult daughters, have as many readers might feel an underlying theme to them, yet they aren’t the focal point of the story. Is there any reason behind it?